Located as far west as you can get in Harris, the Huisinis township nestles between the wild North Harris hills and two fantastic beaches. There are three crofts here; the cattle-grid at the start of the village marking the point you leave the common grazings/hill land and enter the crofts. Huisinis has the only significant area of machair in North Harris. This is formed by the wind-blown shell-sand giving just the right conditions for a multitude of different grasses. The machair grass transforms into a blanket of many colours as summer progresses. Huisinis is an excellent starting point for expeditions into the wild land to spot Eagles and Red Deer. The coastal footpath leaves Huisinis, heading north to Crabhadail. The first part scales the hill overlooking the Sound of Scarp. This is a great place to watch the seabirds drying their wings after long fishing trips. Further on is the magnificent Traigh Mheilein beach. This deserted spot offers beautiful white sands where you can almost touch the Isle of Scarp over the perilous sound. Just beyond the beach is the start of Crabhadail. This valley stretches inland to the south west, and offers good eagle-spotting opportunities and in the autumn fills with the sound of stags roaring and rutting. Huisinis itself is great for playing on the main beach or exploring under the water. The west end of the beach is included in the North Harris Snorkel Trail because of it’s diversity of marine life. To the west of the village, if you climb to the highest point on the headland, there are spectacular views towards Lewis to the North. On a clear day, you’ll also see St Kilda. Closer by, you stand a good chance of seeing otters playing on the shore. 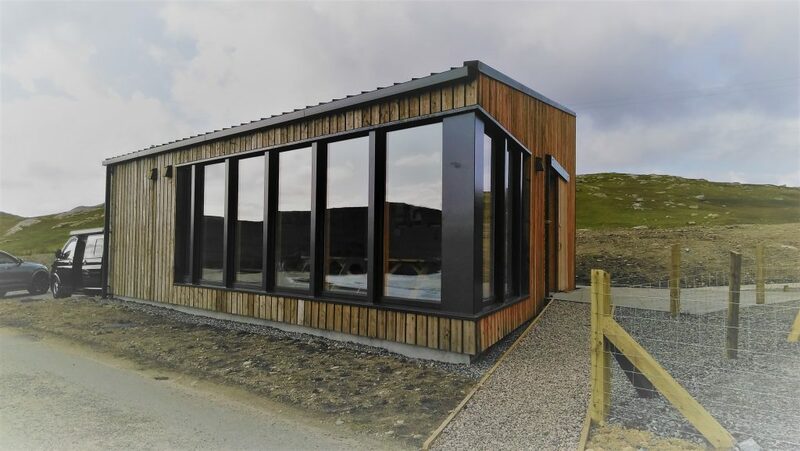 The Gateway building, which opened at the end of 2017, provides toilets and showers for visitors all year round. It has an interpretation area with information on the local landscape and history. It’s also somewhere to shelter on stormy days. In winter, you can sit on the indoor picnic benches and just watch the waves crashing-in on the beach. Located in the main carpark are two general waste bins. Alongside is a Chemical Disposal Point and fresh water standpipe. Both carparks have recycling bins for plastics, cans and glass bottles. Car parking is provided either side of the building. 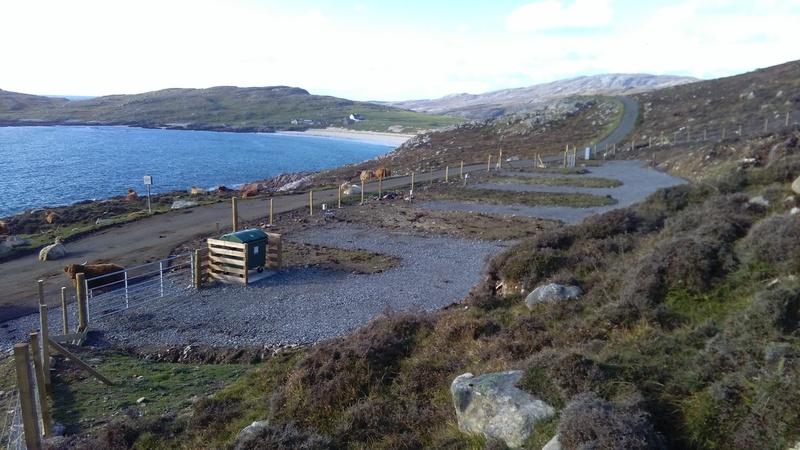 Parking on the machair or the beach-head is no longer permitted by the crofters. Vehicular traffic has been damaging this precious grassland. For this reason, a new camper-van site has been built 400m before the village on less sensitive common land. 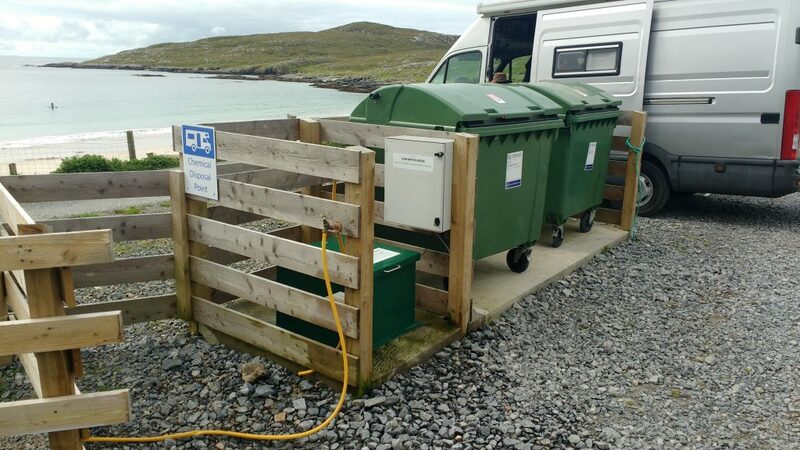 This site provides a number of electric hook-up points, in a sheltered spot, overlooking the bay. There’s a herd of very photogenic Highland Cattle living close by – so make sure the gates are closed if you are using the site. Payment for camping is by donation – a box being located on site. Just turn up and find a spot – there’s no booking required. Electricity and Refuse Collection is provided on site. Water and Chemical Disposal is available at the main Huisinis Gateway carpark. Please note that the electricity supply is turned off NOV-MAR. Huisinis lies at the end of the B887. Use postcode HS3 3AY in your satnav. Be aware that mobile coverage varies considerably along the route and is almost non-existent at Huisinis (unless you are on the EE network – then you can have 4G!). Allow at least 40 minutes to reach Huisinis from the main spinal route.